Cleanup will take weeks, officials said. A massive sinkhole that appeared in Florida on Friday, destroying two homes and swallowing a boat, has stopped growing, officials said Saturday. The hole, in Land O' Lakes, has been stagnant since Friday afternoon, Kevin Guthrie, Pasco County's assistant administrator for public safety, told The Associated Press. Guthrie said officials will monitor the hole over the weekend to decide when cleanup may begin. It's the largest in three decades in the county, which has a history of sinkholes. The sinkhole had resulted in a loss of power for about 100 other homes in the area after the local energy provider cut power for some residents as a safety precaution. On Sunday morning, Pasco County Emergency Management spokesman Scott Withers said power was restored on Saturday to four of nine evacuated homes. Although two homes were destroyed, a third lost about 45 feet of driveway and a septic tank. A total of 11 homes were affected by the sinkhole, Guthrie said. Of the other nine evacuated homes, residents were allowed to return to four of them on Saturday afternoon. The sinkhole was treated as a hazmat incident due to septic tank damage, the Pasco County Sheriff's Office said at a press conference Friday afternoon. Both of the homes that were destroyed were plagued by sinkholes in the past, police said. In 2016, 33 underpinnings were placed at one of the homes, costing $30,000. The home was also investigated and remediated in July 2012. Remediation was also done on the second home in February 2012. Eleven other homes have been evacuated as a precaution, officials said. Authorities had asked multiple families to evacuate their homes after the sinkhole opened up. Emergency workers approached each home in the area to personally evacuate every structure. There were no injuries reported. Pasco County Fire Rescue rescued two dogs from one home, police said. 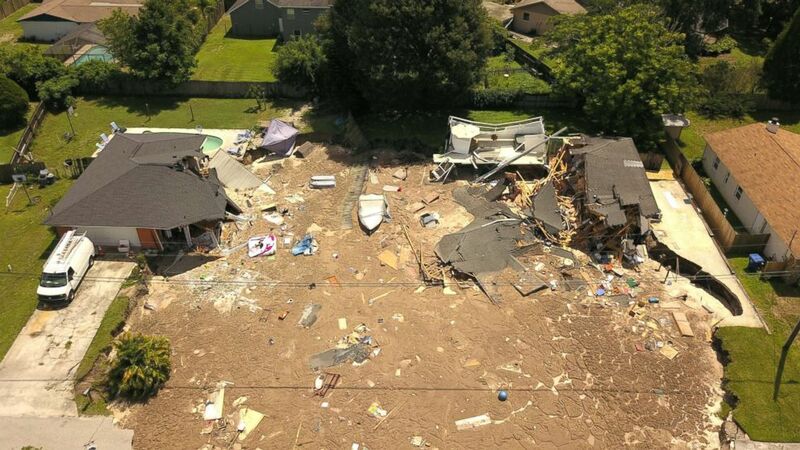 During an earlier press conference on Friday, officials said the sinkhole had swallowed a swimming pool, in addition to the homes and the boat. The hole was filled with water and debris, and officials warned that it could be a month before the issue is resolved. (Luis Santana/Tampa Bay Times via AP) In this aerial photo, debris is strewn about after a sinkhole damaged two homes in Land O' Lakes, Fla., July 14, 2017. A sinkhole that started out the size of a small swimming pool and continued to grow has swallowed a home in Florida and severely damaged another. Authorities first received a call about the hole at 7:21 a.m. when a resident reported that an open depression under a boat, which authorities found completely swallowed less than 10 minutes later, officials said. ABC News' Jason Volack contributed to this report.